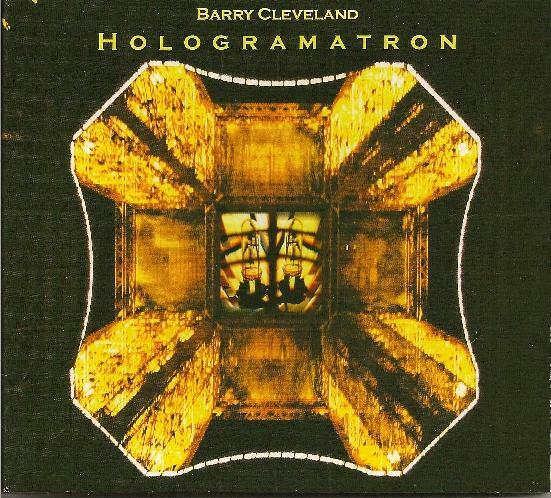 Moderately well known in both fusion and progressive rock circles, Cleveland nevertheless has recorded sparsely throughout his career, producing only a handful of albums over the past 25 years. Hologramatron, his fifth release overall, finds the guitarist/composer in relatively uncharted territory: a mixture of progressive rock arrangements, fusion textures and acid jazz vocalizing. The disc's opening track "Lake of Fire" features Michael Manring's serpentine fretless bass surging through a Les Baxter-like 50's sci-fi groove with Cleveland's un-guitarisms sounding more like sleek, steel synthesizer pads than any traditional stringed instrument. But the spitting, hissing rap of vocalist Amy X. Neuburg has a tendency to distract the listener's attention from the song's driving headlong momentum. "Money Speaks" follows a similar course: a funked up propulsion engine (courtesy of the aforementioned Manring and drummer Celso Alberti) harnessed to the elegant chassis of Cleveland's alternately spiky and sinewy guitar. Here, fortunately, Neuburg's smoky, jazz-tinged vocal works more to fortify the song's instrumental framework than weaken it. "Suicide Train," on the other hand, is an angry, frenetic rocker that recalls the glory days of King Crimson at its galvanizing best. Still, Cleveland works better as an instrumentalist/jazz fusionist unencumbered by considerations of voice and text. No doubt this is why the best tracks on Hologramatron ("You'll Just Have to See It to Believe," "Abandoned Mines" and the Joe Meek classic "Telstar") are the instrumentals, full of a controlled fiery intensity just barely held in check by Cleveland's flawless technique and his skilful, open-ended arrangements that allow for plenty of pyrotechnics. "Abandoned Mines," for instance, features a slinky rhythm section over which Cleveland's guitarviol weaves snake-charmer like in a sensuous dance of mist and veils. The album's remixes-as is usually the case with remixes-are of only passing interest, though Forrest Fang's demolition and reconstruction job on "Abandoned Mines" is engagingly eccentric, emphasizing its core sound material as the raw substratum for the creation of a futuristic ambient dreamscape. What you'll really want Hologramatron for, though, is its fidelity to a now rapidly vanishing ideal: an artist's almost total commitment to his art as an expression of his own unique human potentialities.